Membership in the AGSD is open to all persons 18 years of age or older, families (including minors), institutions, organizations, etc., that pay or defer the yearly membership dues regardless of location, race, creed, nationality, or other qualifications that could be considered discriminative or restrictive. In order to receive copies of The Ray, our quarterly newsletter, you must be an active, associate, or deferred member of the AGSD. All annual AGSD memberships expire on December 31st. There are two types of membership in the AGSD, Active Membership and Associate Membership. 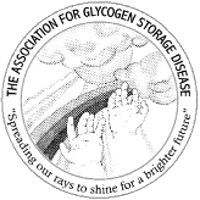 + scientists actively involved in Glycogen Storage Disease research. Active members annual dues are currently $20.00 (U.S. funds only). + any member unable to become an active member before March 1st. Associate members enjoy the rights and privileges of the Association, excluding the right to vote and to hold office. Have you paid your 2019 AGSD membership dues yet? Fees: Active Membership - $20.00 by mail or $22.00 online. Associate Membership - $15.00 by mail or $17.00 online. Complete a membership registration form and submit it by mail, along with your dues payment, to the AGSD office. The AGSD compiles an annual directory of all current active and associate members. The directory is distributed to all AGSD members in the Spring issue of our newsletter, The Ray. These membership lists are to be used for SUPPORT ONLY - whether for emotional (parent - affected) or professional guidance. These lists are NOT for solicitations or requests not approved by the AGSD Board of Directors. Our annual membership directory is distributed solely to current AGSD members and is for SUPPORT ONLY. I would like to receive my issues of the AGSD newsletter, The Ray, digitally via my email address.